You are invited! Los Angeles area aBlogtoWatch audience members are invited to celebrate rare timepieces and the end of 2017 with aBlogtoWatch and Made Worn on Saturday December 2nd, 2017 in West Hollywood, California at the private Made Worn studio space. The exact address will be shared with those who have successfully RSVP’d, and note that space is limited. Made Worn, a unique high-end fashion concept imagined by creator Blaine Halvorson, is also behind some rather interesting hand-engraved timepieces such as these Rolex watches. The Made Worn space is among my favorite places in Los Angeles, and unless you are invited, it is not open to the general public. Also at the event will be a generous selection of rare and very high-end timepieces from a range of brands supplied by Rostovsky Watches. These are also the people who distribute Greubel Forsey timepieces in the United States – and we can promise that even the most discriminating watch collectors will be excited by the items we will have available to play with that evening. Guests to the 2017 aBlogtoWatch Fall Party will enjoy an exclusive space, top-quality cuisine, carefully mixed drinks, and good company. We know you’ll all enjoy, and we look forward to seeing those people who make the RSVP list there. 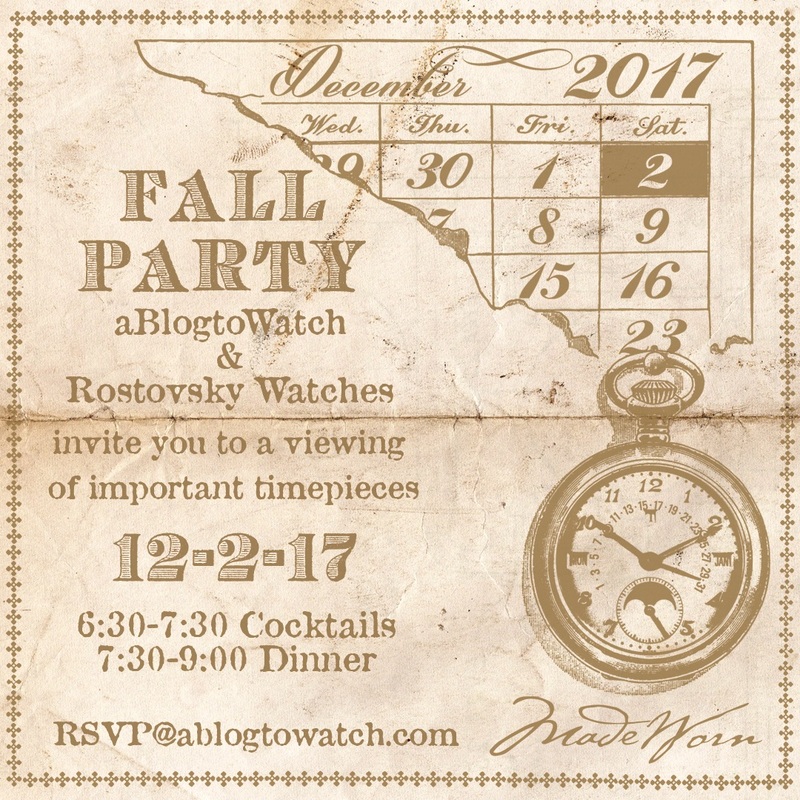 To summarize, the aBlogtoWatch with Made Worn and Rostovsky Watches party will take place on Saturday December 2nd, 2017 in West Hollywood, California at Made Worn. The party starts at 6:30pm, and all guests will be required to e-mail us at [email protected] to reserve a spot. See you there.